This map covers the metropolitan Adelaide region of the state of South Australia. Adelaide, with a population of around 1 million, prides itself on its artistic, culinary and sporting lifestyle. Adelaide has some unique characteristics amongst Australian cities including that it has a particularly high proportion of its population of German ancestry, and intriguingly is the only city in the nation where the locals speak with any hint of a regional accent. Whilst Adelaide was originally a well-planned city, local authorities from the mid 20th Century until recently were beholden to the motor industry, and this dramatically marred the development of adequate rail transport. Adelaide has the least effective metropolitan rail service in the nation, and was until recently the only major city in Australia without electric train services. However as the motor industry departs the city, positive things are now starting to happen on the rails! 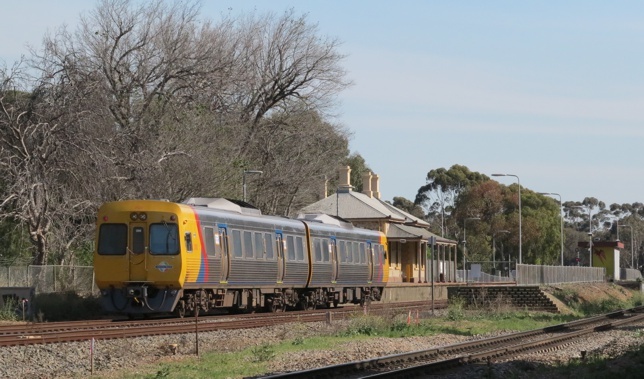 The railway through the southern suburbs to Noarlunga has recently been electrified and extended to Seaford and there are plans to electrify the busy line through the northern suburbs to Gawler Central. 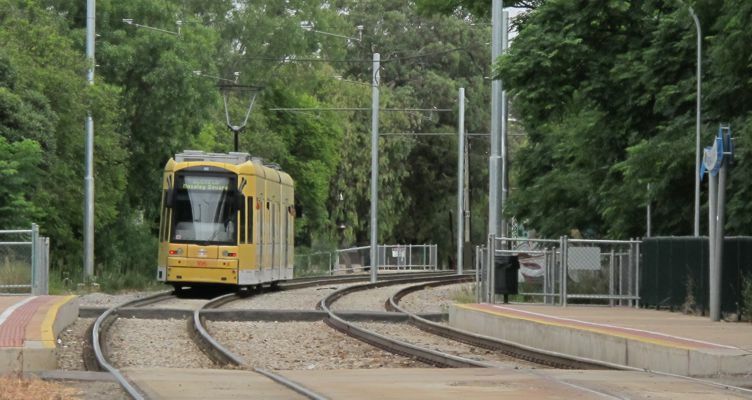 Two extensions to the electric tram network have been opened - one to Botanic Gardens and another to Festival Plaza, and there are potentially more tram network extensions on the way. Download this map in printer-friendly pdf format. Suburban trains are operated by Adelaide Metro. Most trains are operated by air-conditioned diesel railcars runing over four main routes and two branch lines. Trains operate regularly throughout the day but are infrequent at night and on weekends. 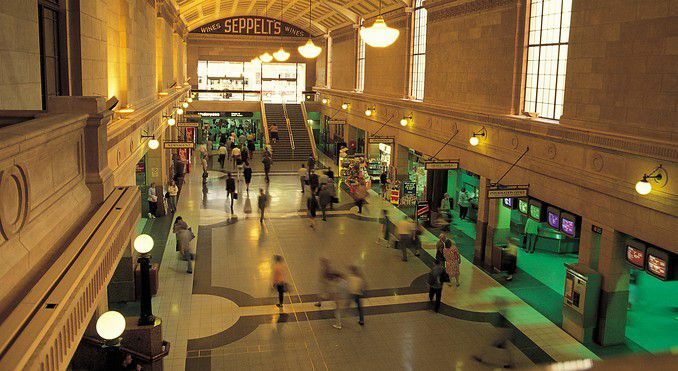 All trains operate to and from Adelaide Station: formerly Australia's grandest station it was modelled on New York's Grand Central terminal. This once wonderful station is now but a shadow of its former self having been converted into a casino. Trains which once majestically arrived and departed at the sweeping concourse that was the front entrance to the city now slink in on an unpleasant covered-over set of tracks almost as if the railway is something of which to be ashamed. Long-distance interstate trains have been banished from the terminal and now arrive and depart at an unremarkable location ironically called "Adelaide Parklands Terminal" in the industrial suburb of Keswick. Adelaide is now however investing once again in its railways. The busiest route to the South has been electrified and extended from Noarlunga to Seaford. Impressive modern electric trains now serve this line. Plans for electrification of further lines have been shelved but will inevitably be re-activated given the stunning success of the rejuvenated Seaford line. There is a tantalising remnant of a wonderful electric street tramway system - the 'Bay Tram' runs between Adelaide City and the bayside suburb of Glenelg. Until 1958, an extensive network of electric tram routes served the city, and despite Adelaide's ideal geography and street geometry to support trams, the network was closed in that less enlightened era. Until 2006 this tram route was operated by wonderful and venerable but antique 1929 vintage American style interurban tramcars. In recent years however, the tram line has been extensively rebuilt, a new fleet of modern trams has been introduced, and the line extended from its long-time terminus in Victoria Square northward to Adelaide Railway Station, City West and further to Hindmarsh Entertainment Centre (Bowden). More recently, two further short extensions opened - one northward to Festival Flaza, and another eastward along North Terrace to Botanic Gardens. This means there is now more than one solitary tram route in Adelaide for the first time since 1958. You might even call it a tram network! Find and book conveniently located Adelaide hotels online with Australian Rail Maps and booking.com. Book Online now. No booking fees. Pay the Hotel when you stay. 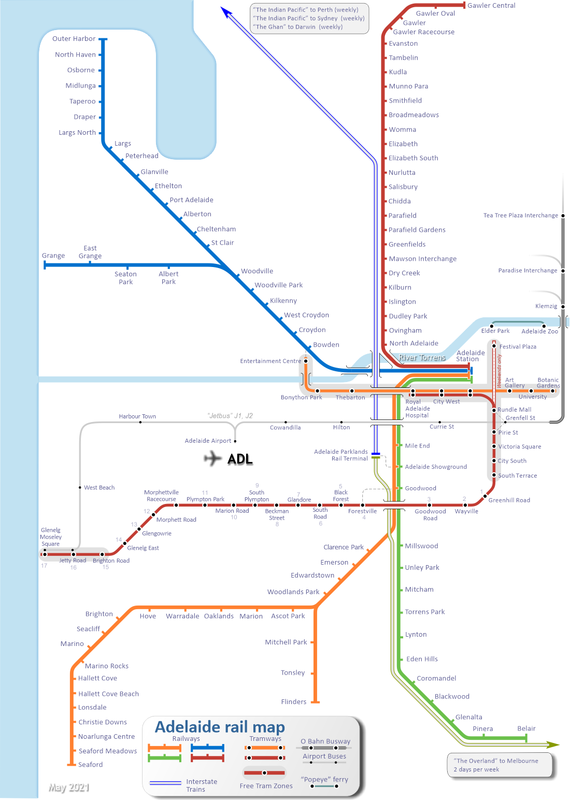 A unique chapter in Australia's transport history is the O-Bahn busway which runs to the North-Eastern suburbs. In the late 1970s the opportunity arose to re-invigorate the tramway by extending it through the city along the 'Modbury Corridor'. 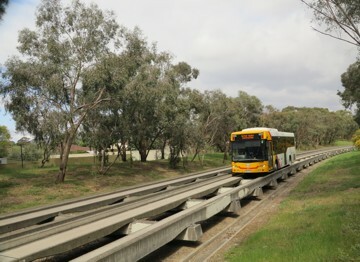 As was all too often the case in Adelaide, a road-based solution was preferred by the government of the day, and the German designed O-bahn guided busway was constructed instead. This still operates today, and is worth a ride whilst in Adelaide as you are unlikely to see too many of these around the world and the busway itself is ageing so it is unclear what its future lifespan may be. Metrocard is the most convenient way to travel on Adelaide trains, trams and buses.